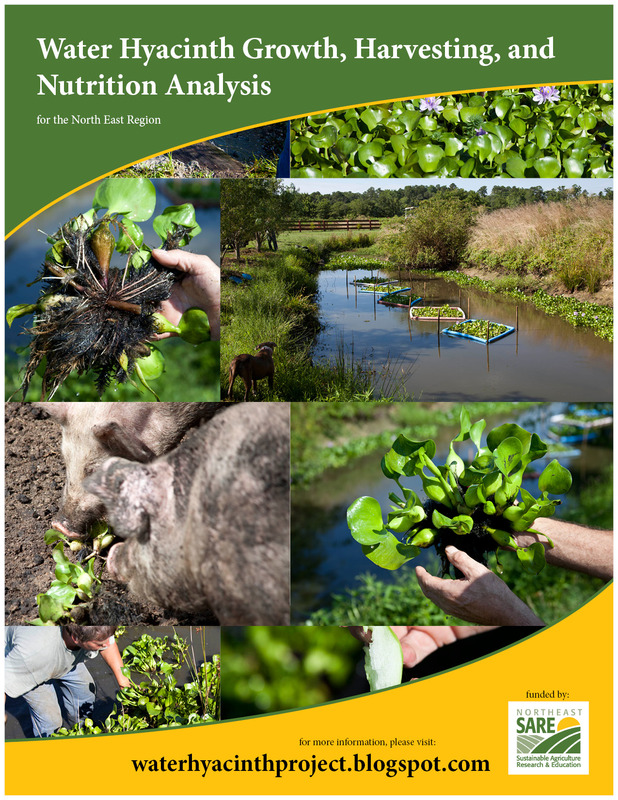 We are seeking to find out the quantity and nutritional value of the water hyacinth grown in a specifically sized ditch for easy scalability/replication purposes. To determine nutritional value, we will take two samples to the lab for a nutritional breakdown. To determine quantity grown, we will quantify the harvests of water hyacinth by the bushel after ditch extraction. Samples of the ditch water itself will also be taken from the growing area for analysis. These samples will serve as reference for other farmers who wish to replicate this project in the future. The growth and harvest of the water hyacinth project has been completed. Documentation of this has been posted to waterhyacinthproject.blogspot.com – this also includes links to youtube videos and various pictures. The water and nutritional samples have been collected and analyzed. A table was set up at the 2012 UMES Small Farm Conference with sample specimens and videos. A brochure was distributed at the table and it is also available at the blogspot page. The remaining items are: post results, summarize findings, and to submit final report. The water hyacinth seemed to grow quickly and most of the livestock seemed to enjoy eating it. Two initial bushels of plant material were planted and about 360 bushels were harvested over the entire time period. We are not experts regarding the nutritional analysis – so exactly how much nutritional value is hard to summarize. We will likely post the raw data as opposed to just summarizing. As a subjective side note – it did appear that the water hyacinth growth in the pond significantly increased the quantity of other pond life including crawfish, snakes and fish. It was not measured, but it may be worth investigating in the future. The only site specific issue regarding our farm was that it was relatively dry and the water level stayed lower than normal over the summer months. The results so far seem to confirm that the water hyacinth is useful for the purposes that we had hoped. The hyacinth grows quickly and most of the livestock seemed to like to eat it. Nothing too significant has occurred on our farm. It would be important to note that we visited other local farms for some of the livestock taste testing to try it with different types of livestock than were available on our own. All cooperators are still as noted on the grant proposal submission.